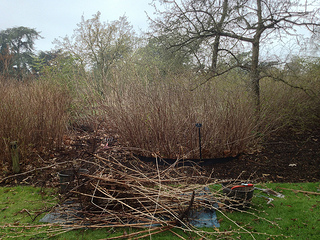 Today I went off to become more familiar with my beds and we planned to manage a Rubus or two. 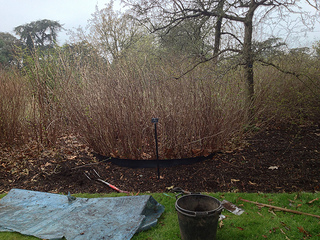 It was a whole day of gardening, me and the plants, which was good as I need to take in all of the changes that have happened in the last few days and adjust to the new pattern of my days. We start work at 7.30 in the morning, which means that I have to wake up at 5, and by the time I get home I am so tired and my evening flies, but I am still studying my Masters module on Environmental ethics, so I have to stay up late. Anyway, people that know me say it really shows I'm happy... and no wonder! The weather is warming up a little bit, so the Prunus trees in my section are starting to flower. 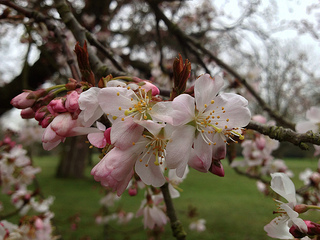 This Prunus serrulata 'Pandora' is one of the first, and is right next to where I'm working.